Something happened. Something very strange yet frankly fascinating happened. For a very long time, I had this conception in my head that one can be sure of something, feel it, deeply believe in it and therefore absolutely live with a conception. Yet, it turns out you can truly never say never. Yup, never hehe. We all change, our personalities evolve as much our center of interests. It’s pretty crazy looking back at the different stages I went through to see how much my style and even way of behaving changed. Or is it just the summer affecting my brain cells? I am still researching it. I’ve always been a little uptight, maybe even mannered. Nobody could ever call me laid back. I was everything but laid back! I’d wear on double wear waterproof mascara at the beach and 8 layers of blush while swimming, at the same time I’d binge of fries and then complain about my looks…Ah, why!? I feel like now is a whole different story. It’s been weeks since I haven’t really wore actual heels, don’t even make me look at a pot of eye shadow if we talk beach day. I swear by tzatziki (I used to absolutely h-a-t-e it before) and fresh fish while only a year ago, I used to eat meat and wheat at all three courses. So what changed? What’s so funny about Kayture is how I am actually building up a visual and textual record of my life. It’s pretty crazy but some times I am even quite tempted to scroll back in my old articles just to see how much I changed. Living it, it doesn’t even feel I did that much. But from the distance, the difference is absolutely insane. I can be my own therapist in a way analyzing the words I used in each of my articles! The only thing I can say for sure, is that this evolution, has definitely been due to the great power of…travel. It’s the only thing in the world that’s possible to buy that truly enriches you, as a person. This fast lane of a life makes me want to be comfortable, enjoy, be myself at a 100% and try new things out. I used to be so afraid of heights and now, I feel so much better. I used to hate greek feta cheese, and now I cry of happiness when I eat some (almost). Travelling teaches you to keep an open mind about everything. Learning to own opinion without closing the box actually, but filling it up with different points of view. Travelling is the biggest luxury and most beautiful thing that exists. My passion, these values, they’re all shared by Louis Vuitton, and that’s the reason why we get along with each other so incredibly well. Since the beginning, the brand has always been our n°1 supporter, pushing us only to the top already thanks to the video we shot. But throughout the year, we had the chance to leave on a few extremely magical trips as we’ve reinforced our partnership with them on a whole different level. This time we were off to Mykonos for a little professional break. After hearing the suggestion all around us, we ended up exploring the Nammos beach, perfect spot for groups of friends who are looking forward to party like animals in the middle of the day, dressed up in tiny bikinis. The party was going wild. Walking around the beach was something too, each girl dressed up in Missoni, incredible bodies. It was something! Mykonos is definitely not the kind of discrete and shy place. It’s all about the more. For the occasion, as we were there with Louis Vuitton, I wore an almost total outfit from the brand. From dress to bikini to shoes, the only non Vuitton thing I had with me was this hat that I’ve by the way been absolutely obsessing with. Honestly, there’s nothing I like more than straw hats for summer. It’s the ideal way to create a little shade and avoid burning the eyes. Hope you guys will enjoy this set of images! You look marvelous. Dress, shoes and bag I love everything. Love that LV bag! Hat and espadrilles are super cute too! Love your look and definitely that bag! I agree with you that traveling broadens your mind! I always feel so much better after holiday or even a short citytrip! Love the dress! Great shots! Lovely blog post, I love your outfit and the photos of Mykonos, Greece is so photogenic! Great photos, love everything in this look, simple ye cool. I think it's normal to change, you can't be the same person all your life. It happend to everyone! I think travel is really change our inner world. This photos are beyond beautiful!! love this natural and very stylish look! Great! You look so gorgeous, as always! I loooove the dress and the shoes, so chic! Yeah, traveling indeed is the only thing you buy that makes you richer. It's my favorite thing in the world! Beautiful photos! You look so pretty and relaxed :) These tote and espadrilles are superb! loving the coral colors - especially the shoes from LV! What place did you stay at? 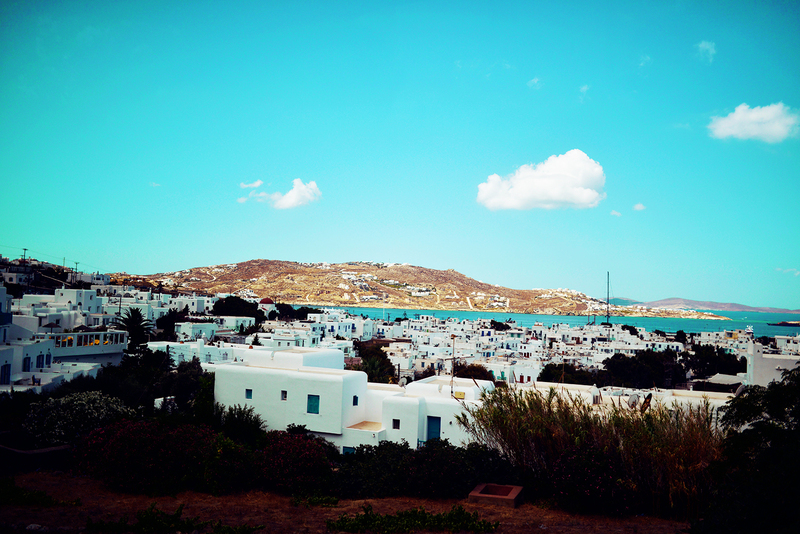 I might just have to put Mykonos on top of my next-travelling-list! You look so beautiful even with less makeup. Thank you for sharing your changes. Parfaite de la tête aux pieds ! Amazing photos! 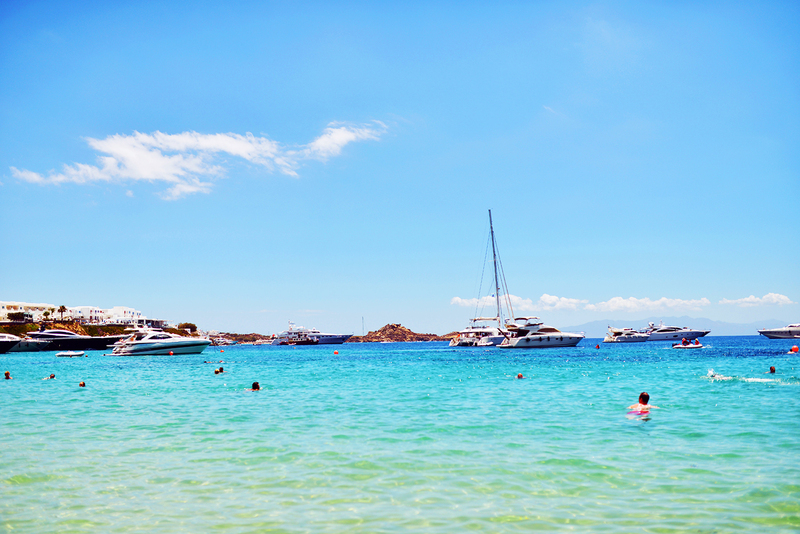 Mykonos is my dream destination! Beautiful place and awesome look! Love it! New look on www.sweetmona.com I hope you! I loved this post, I would love to be able to travel more and see the differences it makes to me! You look as gorgeous as ever too. Thank you for this wonderful post! It's so exciting to see and read about all your travels and adventures! Beautiful photos, as usual! I was there a few days after you left. Nammos was such a beautiful place. I wish I could go back there again. Your journey has been incredible indeed. I live through your blog and travel through it as well. I hope you have a wonderful rest of the summer. Such a beautiful beach outfit - and travelling is definitely one of the best things you can do in your life!! You look beautiful Kristina! It looks like you had an amazing and relaxing time too! Beautiful outfit. I like L.V. Beautiful! Very cool slippers!! I LOVE! This outfit is probably my favorite out of your recent ones !! Love these Louis Vuitton espadrilles! Love your text, and how you described your visual and textual diary of your life ! I so agree with you, and it's so great you allow yourself to change, and be more laid-back, as it's a style that suits you a lot ! Especially when you're dressed in Vuitton resort ! Fab hair as always, and love your espadrilles ! You are so right about the traveling! I'm attending college in a different country, where things are so different than at home. I've learned so so much and met so many people from different places I would have never met if I hadn't taken that risk to fly far away for months at a time. After seeing so many different lifestyles, styles and points of view I think I have never felt more ME before. Its crazy (in a good way) isn't it, travelling? AND your outfit is perfect! Your outfit is amazing. I love the shoes!! I am from Hong Kong and now living in switzerland. Enjoy COOLAGE at http://www.mycoolage.com and LIKE my facebk page! Amazing outfit and deep intimate thoughts. Major crush on your espadrilles! Lovely outfit. Yes, since I read your posts (since about 3 years), your texts have been changing a lot... i love that you share a lot things with us... its very interessting to read that!! I know its very privat, but I still have to ask about your relationship with James, what changed? Can you tell more about that? I’m an italian girl and I’ve been following your blog for quite a long time now, because I really like your style and I admire you as a person. I’ve always had a problem, something I don’t like of my body: I have big calfs and I really don’t know how to make them smaller, specially because they are quite muscular. Following you, I noticed that your legs changed and became slimmer. I would be very grateful if you could help me and tell me how you managed to reach you new shape (eating routine, exercises…). Thank you for reading this, I wish you the best, keep on doing what you do, you’re truly an inspiration! I really do like this blog post, dear Kristina! Thank you for being such an honest writer! Great article, I with every word. Travelling helps you evolve as a person, opens up ones mind and makes you a better person. Lovely outfit and great shots! Je te comprends, je ne pourrais pas vivre sans voyager honnêtement. Stunning. It's so perfect having an online diary to scroll back through isn't it?! You look gorgeous and it just goes to show that if you put the effort in, you can achieve whatever you want! Yes, we really enjoyed it. Beautiful photos! Perfect photos. Perfect weather. Thanks for sharing. Change is natural, it's actually good it means you can adapt to a new lifestyle and improve yourself. I absolutely love the outfit! The LV tote is very cute! Congrats on your travels and success! You are so pretty without too much make up on! ♥ OMG! This look is really inspiring for go to the beach! hat is great for sun protection and go chic at the same time ... good choice. Beautiful photos, as always. Everything is just so stunning, you are living the dream! I can only hope that one day I will be lucky enough to experience even a fraction of the world as you have. You deserve it, Kristina! Love it!! Check out my website thelifestylereporter.com for tips and tricks for fashion, beauty, health and more!! C'est plutôt bon signe, si les voyages te font changer. Tu n'as plus non plus le même âge et les mêmes envies qu'au début de ton blog. Et puis, comme a dit le philosophe Montaigne, "Les voyages forment la jeunesse"! You are just perfect!! I'm totally in love to your glowly make up !!! J'adore! You're such a beautiful girl Kristina! You really inspire me and thank you for that! I'd really love to be a great blogger like you! Love this post! Hello from Spain Kristina! Pretty as always. I love not only ALL your outfits but the way you write is amazing, it feels like we teletransport to Mykonos with you or wherever you go because we can feel your enthusiasm and happyness in every post you write. Congratulations because all the work you have done so far and keep going that way, alwas improving and thinking of new ideas. Being in Mykonos is amazing! Being in Mykonos WITH LUIS VUITTON is more than crazy! Superfun photos I hope you enjoyed! I thjnk would really appreciate your content. Please let me know. You've captured the appeal of Greece beautifully! I love this place where I was last summer !